Pork | Retired? No one told me! I am now on Take 3 of the sourdough saga…I am not giving up…I went out bought wholemeal flour..ditched the expensive unbleached flour and started again, so far so good…We might get a sourdough loaf, fingers crossed…It has definitely been a learning curve but hey ho nothing in life is easy is it? Definitely not cooking. You have probably noticed that my recipes are all cooked from scratch contain healthy ingredients which have proven health benefits…I am trying to break the mould or the myths that healthy food is bland and/or boring…There seems to be a barrier to me… we just need to know our food and what the benefits to our health is and cook accordingly. I don’t spend hours in the kitchen and I don’t think that I buy special foods or expensive foods and I certainly don’t feel deprived in any way at all…It is also foods which we all eat ..grandkids included although we limit the heat for little Lily or take her portion out before we add all the chilli. I ummed and I ahhed and expressed my unwillingness to try it…Made with matcha green tea then cream cheese is frothed and added to the top…So I succumbed to Aston’s just try it, nan! One of my favourite curries and one which I don’t have very often…why? Not sure really…I probably save it for special occasions. I had Duck curry for the first time on a little island just off Phuket, Thailand it is a fiery curry offset by pineapple and tomatoes. Some add lychee as well as pineapple but we found it a little sweet for us but experiment, everyone’s taste is different….I also add some vegetables, mange tout or sugar snap peas, a few florets of brocolli..really whatever I have in the fridge. Firstly cook your duck breasts, we like ours medium rare. Put the duck skin side down in a cold pan, turn the heat to medium and cook the duck breasts for 6-8 minutes until the skin is golden and crispy, turn the breasts over and just sear the other side for 1 minute. Turn over so they are breast side up and put in a pre-heated oven at 200 degrees for 7-9 minutes. Remove from oven and rest for 10 minutes before slicing the breasts thinly. 3/4 cup fresh pineapple cut into bite-sized pieces. 6-10 mange tout..or other vegetables of your choice. If you can’t get these any small eggplant will be ok I sometimes use small purple ones if I can’t get the green. 1-2 tbsp red curry paste. Bunch Thai basil washed and leaves picked..
To make sauce put a very tiny drop of oil in the pan over medium heat add your curry paste and stir to cook for 1 min, add fish sauce. Gradually add coconut milk whilst still stirring. Bring to a slow boil and add torn lime leaves and eggplants cook for 5/6 mins and add tomatoes and pineapple, cook for a further 10 minutes then add mange tout and stir in some Thai basil leaves and lime juice. Now taste and adjust curry paste if you want more heat. If anything else needs adjusting you can also do that now. Thai flavours are very pronounced and if you get it balanced ..very nice if not…I have had some disasters and I don’t mind admitting that…which is why I always say TASTE and Taste again. The very first duck curry I made was ok…so we left out the lychee the next time and it was much better…also, I know which curry paste to now use as they are all so different…Please don’t let this put you off making it as when you get it right it is a lovely thing. When you are ready to serve then add sliced duck to the sauce and just warm through and serve with some Thai basil over the top and slice red chilli if you like. Jin Xian Oolong No 12 Tea also known as Golden Lily Oolong tea is 100% organic and contains no artificial additives. Grown in the northern mountains of Thailand 1200-1800 metres above sea level it is untouched by pollution… a low oxidised tea of twisted little balls /snails… Called BiLuoCun which means the green shell which because the tea is hand rolled it looks like small snail shells..hence the name. Dut to its high concentration of antioxidants, vitamins and minerals it is said to increase the metabolism thus breaking down fat, reduce cholesterol and improve skin condition. Kaipa Wild Rice...I know wild rice takes longer to cook however to cut down on the cooking time for brown or wild rice, soak it overnight. For brown rice, the water-to-rice ratio is 2 to 1. For wild rice, cover with a generous amount of water, several inches above the rice. Soak the rice in a covered pot and keep in the refrigerator about six hours or overnight. This Highland brown rice is grown by the Pakayor hill tribe …It is long grain rice similar to Mali rice. The rice contains gamma oryzanol which is an antioxidant that helps prevent free radicals. My experiment this week ( apart) from sourdough…was Pork and Blackbean Sauce. Put the pork fillet in a bowl with the first 7 ingredients. Now massage the pork with your hands to incorporate the marinade otherwise it will just sit in the ingredients and we want it to absorb the flavours anything we make here which has a marinade is massaged in with the hands. Let it sit for about 10 minutes. Heat 2 tbsps of your oil then add your pork and stir fry for 2/3 minutes until it is almost cooked. Transfer to a plate. Drain the oil from the pan and keep for stir-fries or something and add the other tbsp of oil and add your cabbage cook for 1 minute… I used cabbage as it added another texture/vegetable and next time I would add more cabbage. Return the pork to the pan and add 2 tbsps of black bean sauce stir fry for 2 mins and taste add some salt if required. Serve with rice or noodles and drizzle with sriracha or chilli oil. This entry was posted in Carbon Footprint, Carol Cooks2, CarolCooks2...In my kitchen, Cook from scratch, Healthy Eating, No faddy diets just healthy food, Shop local, Uncategorized and tagged Authentic Thai Food, Green Tea, Jin Xuan Oolong no 12 tea, Kaeng Ped Pett Yang, Matcha tea with cheese, Pork, Pork and Black Bean Sauce, Thai Duck Curry', wild rice on February 15, 2019 by CarolCooks2. 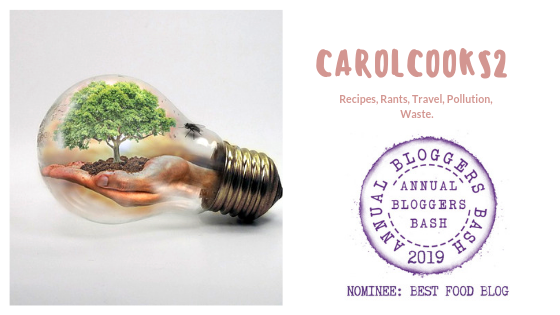 Smorgasbord Blog Magazine – The Cookery and Food Column with Carol Taylor – #Pork! Perfect! Welcome once again to Carol’s Cookery column and this week it’s one of our family’s favourite meats after Beef (now) I have found a butcher… I do hope that you enjoyed the Beef recipes last week. How to get perfect Pork crackling every time. Nothing is better than perfectly crisp Pork Crackling. How to achieve it, well, it’s easy! When you buy your Pork, look for pork which has a layer of fat underneath the skin (this) produces the best crackling. It has to be thinly scored, for this, I actually use a Stanley Knife and woe betides anyone who uses it for D.I.Y. This entry was posted in Carol's Cookery column on Smorgasbord, Cook from scratch, Crispy Pork Crackling, Pork rib rack, Roast Pork, Sally at Smorgasbord Health 2018, Sally Cronin, Uncategorized and tagged Carol Cook's, Orange Pork with Watercress rice, Pork, Recipes, Retired! No one told me! on May 16, 2018 by CarolCooks2. Bacon contains nitrates which some have an aversion to using or it causes headaches and other adverse symptoms. Today I am using celery juice..just put the celery in the juicer and out the other side and viola this lovely vibrant green juice. Now celery also contains nitrates but they are naturally occurring although for some may still cause headaches if your aversion is to chemicals then celery may be a better way to cure your bacon. I used 2 Kilo’s Pork Belly. 2 parts rock salt to 1 part sugar. A bunch of Lemon Thyme. Celery Juice as required to make the mix damp. Finely slice bay Leaves and lightly crush with other spices in Pestle & Mortar. Combine with Sugar and Salt and mix with liberal amounts of celery juice until damp. Place Pork in a sealed container or bag ( I used a brining bag). Turn halfway through the week. That is why I like using brining bags as it is much easier to turn the pork belly over. Store in the fridge for 5 Days. After 5 days remove the belly pork and wash thoroughly. Cook in oven @ 100 C for 2 hours. Cool and slice. It also looks lovely and pink ( no grey) which means the natural nitrates in the celery juice had worked their magic. Have you made your own bacon and if you did what did you use? Now the tester…How will it taste? It smells like bacon, looks like bacon and made a lovely sandwich…. Before you say yes I cut it thinly and no not everyone in the household likes it like that but the beauty of making your own is everyone can have their bacon sliced to their own requirements …How cool is that? A piece of Pork…top of leg……mine was 3 kilo. Suitable plastic( not metal) container to brine meat in. Mix the dry rub, and rub the ham, making sure it’s well covered. If using a 7-8 kilo ham you will need a double batch. Place the ham in a large container, cover with a clean tea towel and leave in a cool place, like the fridge. Now mix the brine in a pot and cook up and cook for 10 min. Remove the pot from the heat. Remove the foam when it stops bubbling and leave to cool and save in a cold place. Pour the cold brine over the ham so it is covered. Turn the ham from time to time during the curing time. Use clean tongs and plastic gloves. Let the ham brine for 14-20 days. IF the brine goes cloudy, make new brine and replace the old brine with that and keep curing it. Tip: Wear gloves even when dry rubbing. 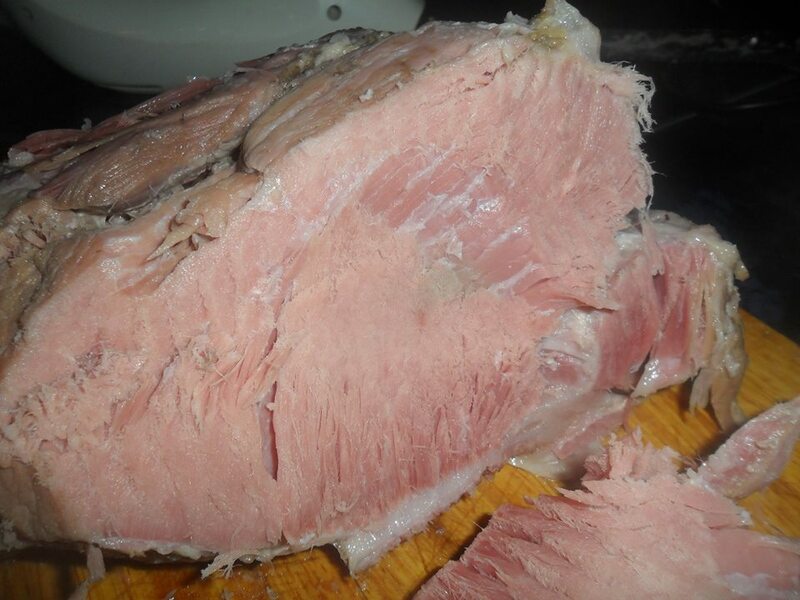 When ham cured use your favourite recipe to cook and voila a lovely ham. I have cooked mine all ways usually I cover with water, bring it to the boil and then drain off all the water. Add fresh water and all my spices…I add a couple of bay leaves, mustard seeds, coriander seeds, about 3/4 cloves, a star anise and maybe a cardamom pod also about 2 tbsp of brown sugar…I cook for 20 mins per 500 gm of meat and then allow to cool overnight in the cooking water it is then ready to eat. I have also once it has finished cooking scored the fat and studded with cloves, brushed with honey and put in the oven for 20 minutes. My third way which I did last Christmas was to use loin of pork instead of the leg and scored the fat….when I got to the boiling stage I added water to just below the fat and then when it was cooked covered the meat with foil leaving just the fat exposed then oiled and salted the fat wacked it in a high oven to crisp of the crackling…It went down a storm everyone loved it…A bit more work but crispy crackling with your ham…awesome! I made the conscious decision that for the amount used and the dilution per litre of liquid that as the body can cope and disperse with the nitrate I would use that rather than getting botulism which the body generally doesn’t cope with. This entry was posted in A taste of old England, Cooking from scratch, Home cured Bacon, home cured ham, Recipes and tagged Celery juice, Christmas Ham, Home Cured, Pork, Recipess on December 6, 2017 by CarolCooks2. Potassium is vital to our good health and we need to eat enough potassium each day to maintain a healthy body. Potassium can be found in every one of our bodies cells and plays a major part in our continued good health. Although let us be clear it is not potassium alone which keeps us healthy. But to feel our best we should eat enough potassium-rich foods every day to help prevent certain chronic conditions. Regularly not eating enough potassium-rich foods could jeopardise our long-term health in many ways. Adults over the age of 19, adolescents between 14 and 18 years old and pregnant women should consume 4,700 milligrams of potassium each day while limiting themselves to 1,500 mg of sodium.says the Food and Nutrition Board. Nursing women over the age of 14 need more: 5,100 milligrams daily. Please note however and I always stress this …moderation… but too much can be just as damaging to your health. The body needs a delicate balance of potassium to help the heart and other muscles work properly. But too much potassium in your blood can lead to dangerous, and possibly deadly, changes in heart rhythm. Home cooking does determine our intake of potassium but boiling depletes potassium. For example, a boiled potato has almost half the potassium of a baked potato. To preserve potassium, eat fruits and vegetables raw, roasted or lightly steamed. Food rather than supplements is always a better option for increasing your intake of nutrients as foods contain fibre as well. Let food be thy medicine is my mantra. I just have this thing about supplements of any sort and maybe it is me but I prefer to eat food rather than take a powder or tablet. There is nothing like a healthy drink of Coconut juice fresh from the fruit. If you take prescribed medication, please before you embark on any change of eating plan always ask your doctor or pharmacist about how all of the medications you take affect the potassium levels in your body, and if you need more, or less, of the mineral. Until next time stay safe, laugh a lot as of all the medicines laughter is the best…. This entry was posted in Fibre, Potassium, Uncategorized and tagged Bananas, Coconut juice, Lentils, Pork, Potassium, Potatoes, Salmon, Squash, Sweet potatoes, yoghurt on August 11, 2017 by CarolCooks2. Spicy red curry, Pork,Rice and coconut balls. These spicy rice balls are a lovely way to use up any leftover cooked rice and are quite delicious. They are one of the first things I was taught to cook by my daughter in law more years ago than I care to remember. Whenever we have a party or anything they are one of the first things to be eaten, adults and kids alike they love them. We had these last night and we did have a couple left over….. guess what I have just had with some ginger and chilli, lime juice squeezed over it and wrapped in a white cabbage leaf… all the Thai flavours and textures..so yummy! 500 gms cold cooked rice. 1-3 tbsp red curry paste. Mix all ingredients together it will be slightly sticky. With wet hands shape into medium sized balls about 3-4 cm. Heat oil until hot but not smoking as the outside will cook before the inside and cook rice balls 15-20 minutes until brown and cooked through. These balls are best eaten with a piece of white cabbage, some diced ginger and chilli put ball or part of it on cabbage and wrap around, squeeze some lime juice over it and eat, it is a crunchy fusion of Thai flavours, so yummy. If you are a vegetarian then omit the pork and you still have tasty rice balls….In fact, a lot of the balls you buy on the markets do not have Pork. If you don’t use pork then adjust your cooking time. If you are not sure of the level of spice then form a small ball having used the lower level of paste and fish sauce, fry a tester.Then if you need to ..Add more chilli paste. This entry was posted in A Taste of Thailand, Authentic Thai Recipe, Cooking from scratch, Spicy red curry pork balls, Uncategorized and tagged blogging, Coconut, Limes, Pork, Red curry paste, Rice on December 3, 2016 by CarolCooks2.